Couture house Ralph & Russo creates made to measure garments sought after by women worldwide, from royalty to celebrities alike. They commissioned the UX & UI redesign for the private client account area on their website. A private account is created for each client finalising an order, which can include one or more pieces of clothing. 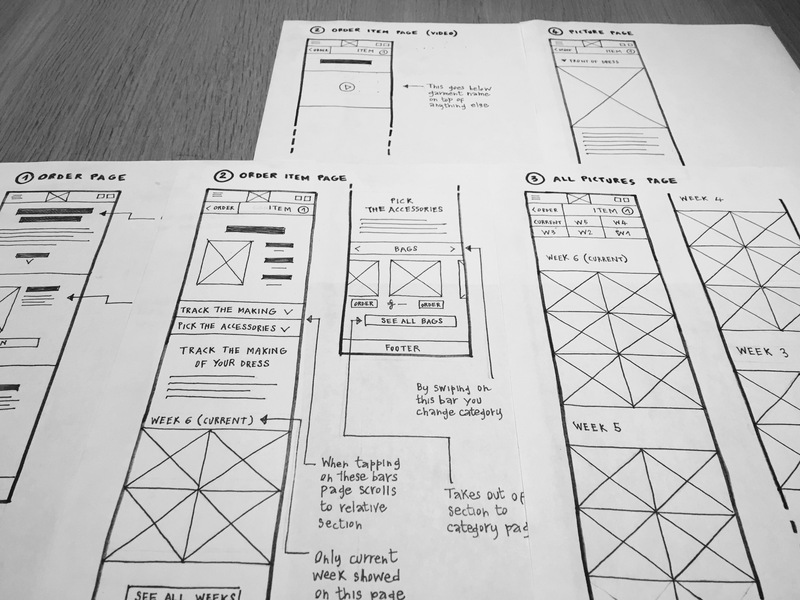 The redesign had to be centered around a picture archive documenting the garment creation from concept to completion (purpose A). Additionally it had to incorporate a section populated by accessories selected to specifically match the purchased garments (purpose B). 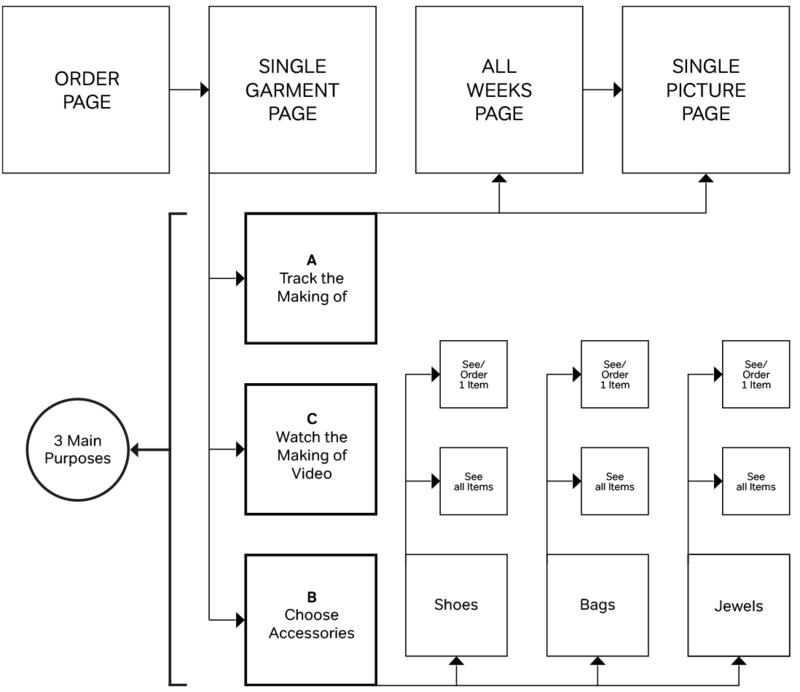 At completion of the sartorial work, it also had to host a ‘making of’ video, in view of the order delivery (purpose C). Stylistically the new area had to stick to the same fonts, colours and guidelines set for the rest of the website. Explore navigation by using the gray arrow buttons below. This device was designed and coded in-house for demonstration purposes using working material. After login, the landing section of the Order page shows a message of congratulations for the order made. By swiping down, the user sees the garment items constituting his order. By tapping the Open button he opens the Garment Item Page for the chosen garment. The landing section of the Item Page presents the garment sketch with information on production schedule on the side. At the bottom of the display two selectable bars give the user a choice on how to utilise the page. Tapping the first bar takes the user to the Track the Making of Your Dress section. This section is populated with pictures documenting production. By tapping on a picture box, the user opens the Single Picture Page, where the chosen picture is in full screen size and is followed by a textual description. Only pictures shot during the current week are showed on this page. By tapping the See All Weeks button, the user opens the All Weeks Page. Here pictures are archived on a week by week basis from the beginning of production up to completion. By tapping on one of the week buttons the user lands on the section for the corresponding week. Tapping the second bar takes the user to the Pick the Accessories section. Here the user is presented with accessories hand-picked to match the purchased dress. The accessory category can be chosen by swiping on the category bar. Below, a specific accessory can be selected by tapping the corresponding Order button. By tapping the See All... button, the user can browse all products within the selected category. Both the Order and the See All... buttons take out of the private client account area to the corresponding pages on the Ralph & Russo website. At garment completion, a Making Of video is uploaded at the top of Item Page with the purpose of celebrating the making of a sartorial masterpiece and of signalling it is ready for delivery.